I can't believe Casey has never invited me to guest on her blog here. 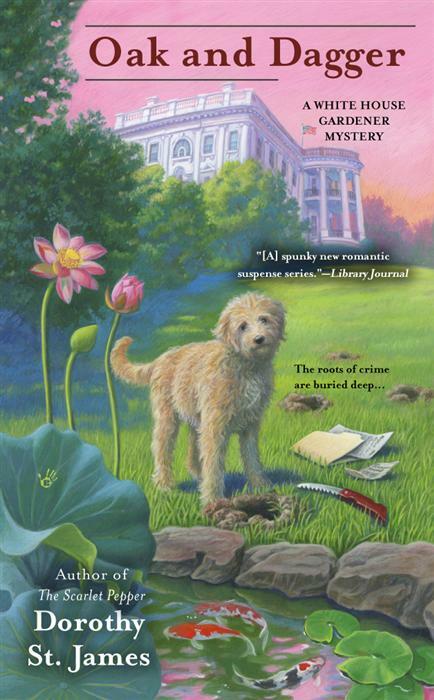 Heck, she didn't even tell me about Killer Characters before yesterday when she came bursting into our townhouse, up to her ears with holiday preparations at the White House, and needing me to bail her out. "Are you sure you trust me to do this?" I had joked with her. "I suppose I don't have a choice," she replied and then sighed deeply. "Just don't talk about your dating life. I was supposed to write a blog about Christmas Traditions in my family. So write about that...your family's Christmas traditions. But PLEASE don't mention your love life. OK?" Well! Not everything revolves around the men in my life. And won't Casey be surprised to learn that my family has carried on a very special Christmas tradition for as long as I can remember? Not only that, it's a tradition that involves the White House! You see, before my mother fell in love and married my dad, she worked as a secretary at the White House. Oh, she loved that job and loves to tell stories about her work (and play) while living in D.C.! To commemorate that happy time in her life, every December my mother orders the official White House ornament from the White House Historical Association. This year will mark the 32nd year that they've been sold. Here's a picture of all the ornaments that will grace our family Christmas tree. This year's ornament is a fun one. The 2012 ornament features President William Howard Taft. He was the first president to use an automobile at the White House. That was in 1909. Before then all presidents rode in horse-drawn carriages. You can purchase this year's ornament, as well as those from years past, from the White House Historical Association's official website. See, Casey, I didn't mention tonight's hot date. Not even once. By the way, don't wait up for me! What are some of your family's special holiday traditions? Leave your answer in the comments. 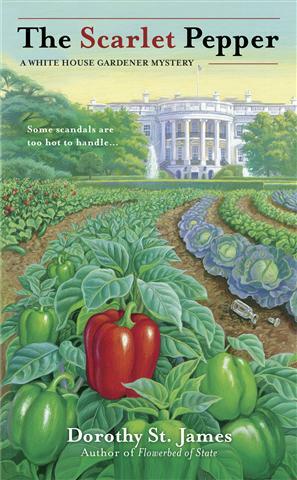 One lucky person will WIN a copy of FLOWERBED OF STATE and a copy of THE SCARLET PEPPER. Good luck! And be sure to check back to see if you won! We always celebrate the family christmas on christmas eve. We do the immediate family on Christmas morning, but I love spending Christmas eve with my extended family. Look forward to it every year. We always opened our gifts on Christmas Eve, after church (Santa always delivered to our house fairly early!) and I can remember as a little kid how very, very long those services were. Thanks for ornament collection, I had never heard of the White House doing that! This books sounds great also, will have put it on my reading list! Merry Christmas! My family loves their stockings. I took over filling the stockings when I was a teen at home and spent all year looking for special little gifts and I continued to do the same once I had kids of my own. My two children often spend way more time opening the little gifts in their stockings than they do the "big" gifts under the tree. I also make advent calendar bags for my nieces and nephews and my own chlidren. They look forward to opening the litte gifts all December long. The first group is getting ready to go off to college next year and I think they want them to follow to the dorms next year! Christmas traditions include opening our gifts on Christmas Eve. Santa also came to our house, early. I was not aware of the White House Christmas ornaments so have learned some thing new today. When my daughter was younger, Christmas Eve was for opening family gifts. This way, there was plenty of room under the tree for Santa to bring his gifts, giving us an exciting Christmas morning. kuzlin(at)aol(dot)com. We used to purchase a special ornament each year, too. But for some reason in the last few years, we've gotten away from that tradition. Hmm. Might need to fix that for this year. My favorite ornaments are the ones that my children made. Especially the ones with their pictures in it. We light the Chanukkah menorah and then my granddaughter gets her gift. We have sppend family time. Growing up on the South Dakota prairie, there were no tree farms to go cut your own tree or woods to go find a tree to cut. So my parents would buy a tree in town and then my dad would hide it somewhere on the farm, or in the fields around the farm yard. Then on a Saturday, we kids would go out to find it. Sometimes we found it fast, sometimes it took a while. Dad could be tricky. When we found it we would come back with it and have fresh donuts and hot chocolate. Later we would get the tree up and decorated. It was a great tradition and got all of us kids out of the house on a Saturday and we had to work together. Fun times! We always have a special, fun move that we look forward to watching together. My sister and I give each other presents for the twelve days of Christmas. our family tadition is to put the tree up after thanksgiving and we all help. It is so much fun. Tradition is to buy a special gift for each pet in the household. Usually catnip plays a big part in selection. The other day I told my husband I don't remember 'believing' in Santa, but he did. When I was little, we opened all the gifts on Christmas eve, so maybe that is why. With our children, we opened gifts Christmas morning and it seemed I was always in the kitchen most of the time preparing the noon Christmas meal. Okay, we don't do that any more. Since we seem to do different things every year, I guess our tradition is hanging the homemade ornaments on the tree - can't miss that. We open our gifts on Christmas Eve. It's wonderful to all be together. Every Christmas eve my husband and I wrap presents for family and each other then fill each other's stockings and hang them at the end of our bed for the morning. We stay up late to eat mince pies and watch a Christmas movie then when it hits twelve O'clock I wish him Happy Christmas and he wishes me Happy Birthday. (Im a Christmas Baby)Then the next morning we get up early to take our dogs for a walk then open our presents (I have bithday cake for breakfast) then we walk to my mother's house or my brother's where we will exchange gifts and have Christmas lunch.After lunch the board games come out and we are all play along while ating too much and laughing a lot . That is lovely, thanks for the guestpost. I don't think my family has any traditions. Christmas is not celebrated the American way for very long yet here in Holland, we have a different feast on December 5. But we always do gather for a great Christmas dinner, cooked by my father (and cleaned up by my mother and us). Like most children, we were hard pressed to wait until Christmas morning for our gifts. So the tradition was started that we each got one gift (parents' choice) on Christmas eve. Somehow, it worked. We made it to morning. Our family tradition is having a big breakfast Christmas morning and then after breakfast we open our gifts. That car ornament is awesome - might just have to get that! When we lived in the DC area years ago, I started collecting the White House ornaments but have gotten out of the habit. Thanks for the link to their website. I've got to catch up. 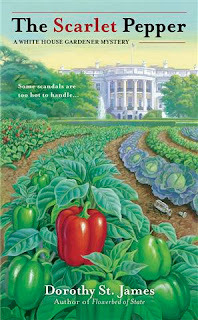 And I'd love to catch up on the White House gardener mysteries too! No special traditions at my home, just opening presents on Christmas Eve. We usually have pumpkin pie for Christmas. 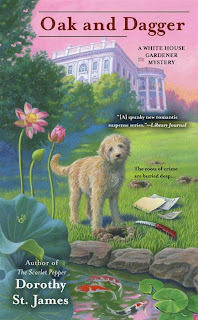 I like the cover of the book, especially the pink color and the dog. Oak and Dagger is a good, original title. We bake sugar cookies and frost them. Make buckeyes. The Car Ornament is wonderful. Thanks for letting us know. Baking cookies and making homemade caramel corn. There are some special treats we like to make - a fruit punch wassail or spiced apple cider in the slow cooker, Mom's special spinach dip, special cheese & crackers tray and Pillsbury orange iced biscuits on the day. There are ornaments we look forward to seeing every year... I don't know that we've ever thought of these things as traditions. The car ornament you've shared is very pretty! My dad and I always had oyster stew on Christmas eve. Only time all year we ever ate it. We don't have any special traditions, I used to like to bake cookies for Christmas. Bloody Marys. Then we switched to Beefeater martinis. New Christmas ornaments and mom playing Christmas carols as she cooks breakfast for the family. I didn't know that these ornaments were offered each year. Our Christmas tradition is to pull Christmas crackers after we eat Christmas dinner and we wear the silly tissue paper crowns while we eat dessert. For many years my mom gave me special little things like ornaments to mark the day leading up to Christmas, even after I was an adult, it was always fun. Maybe we can both do that next year. Tradition for a Military Brat -- everything is different every year - except maybe a few cherished ornaments. We always open up one gift each on Christmas Eve & then the rest after church on Christmas morning. One of my BFFs is the event coordinater for the Kennedy Center in DC and he sent me one of the official White House ornaments a few years ago - I recognized it in your picture right away! One of my favorite traditions is adorning our christmas tree with ornaments our family has made or collected over the years. We get a new dated ornament for my mother every year, but also bring out the handmade childhood ornaments as well as any ornaments that have traveled to our home from vacations or trips our family has taken that year. Decorating the tree holds a special place in my heart since I grew up on a Christmas tree farm. Alas, after my grandfather passed away, my father and uncle sold most of the land so now it is populated with houses instead of blue spruces, douglas firs, and scotch pines...but the smell of a freshly cut christmas tree always brings me right back to my childhood and some of the great memories from that time. My Mom was English and was raised with all the grand Xmas traditions so we had beauitful traditions, Xmas eve prime rib dinner, yorkshire pudding and homemade mince pie with hard sauce my Mom made from scratch - then we opened one present. Her tree was magnificent with antique ornaments that date back in our family to the 1800's. Xmas day we all opened presents first with a light breakfast and tea, then helped create a amazing tablescape and ham dinner. I miss my Mom's traditions at this time of year. I have missed this series, thanks for the opportunity to win. What wonderful traditions! Thank you for sharing them with the rest of us. I've gotten some great ideas for new traditions to try out with my family. Now, I need to pick a winner! Our family gets together on Christmas Eve to exchange presents, then Christmas morning, we go to my grandmothers for breakfast then to my mom's to see what "Santa" brought us there and for lunch. When we get together on Christmas Eve, there are always stories and tales regarding loved ones that are no longer with us- reminiscing, crying and laughing. 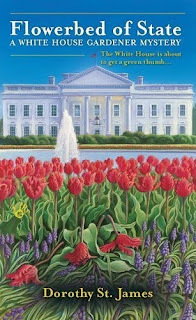 In 1997, my author worked on a case with a group of lawyers in Wash DC, and they sent her that year's White House ornament as a gift. It's kind of heavy, so it has to go on the bottom near the inside, but she relishes it as a reminder of old friendships. Which is part of what the holidays are about, isn't it?